What is the best air purifier? The device should remove pathogens, capture dust, pollen, and dust mites. The latter hide in bedding and mattresses, causing allergy in humans. Also consider the filter type and the sound level. In our view, GermGuardian AC4825 fits all these criteria. Why have we chosen it? Capturing the tiniest dust particles, this air purifier also removes odors and kills bacteria. The unit comes with a UV-C sanitizer and a HEPA-type filter which satisfies efficiency standards set by US Department of Energy. Each day, the problems of allergies is becoming graver for modern society. According to the scientists’ calculations, 10% of human population suffers from this disease. A respiratory allergy is the most common type. We have decided to solve this problem in our own style: by using gadgets — Air Purifiers. In today’s review, I will explain to you how to choose the right air purifier, why you need one, and what models are worth buying if you have allergies. I’ll note that I’ve been especially meticulous about this very guide, as I am allergic to dust mites myself. Although I am an MD and I lead a healthy lifestyle and am overall very sensitive about my health, I am not insured from allergies either. So let’s start and at first I should tell you about allergies. Dust mites are the main cause of respiratory allergy. This tiny insect 0.1-0.5 mm long insect lives in pillows, mattresses, duvet covers, etc. Dust mites do not bite people; its actual existence presents a bigger hazard to humans. It feeds on dead human skin flakes, which peel off in the amount of 1.5g daily. As a result, mites produce feces sized up to 30μm, which are covered in special proteins. When contacting them, people get severe allergic reactions and their sensitivity to other allergens is enhanced. Learn more about how to deal with dust mites in our 5-step guide about How to get rid of dust mites. The second reason is pollen. If you’re not usually allergic to the plant itself, it doesn’t mean that you won’t be during blossoming period. The length of the period will depend on the region you live in and therefore the climate, it can range from a month to the whole year. Dust is another reason. Scientists say that allergies are a problem of an urbanized society. Those who live in rural areas spend most of their time outdoors; that’s why they tend to have fewer allergies. Since we live in concrete jungle, our bodies react to dust negatively, as it gets accumulated there. The solution we have chosen will appeal to many. After all, it is for the lazy ones. You do not need to do wet cleaning every day as all you have to do simply turn the air cleaner on, and it will do all of the work. How to Choose a Right Air Purifier? Please note that on our agenda there is a respiratory allergy today. It therefore defines the main aim of choosing a purifier. The main criteria for choosing a right air purifier are 1) removal of pathogens, 2) destruction of dust mites and pollen and 3) collecting the pollen and micro dust. Also you should take in consideration other things as size, filter type, price and intensity of use, noise. The size depends on the area of the room where you will set up the purifier. The larger the room is, the larger the size and the bigger the capacity of a purifier is supposed to be. Do not assume that if your room area is 100 sq m, a cleaner designed for 20 sq m on your bedside will suffice. This is a misconception. Not every air cleaner or purifier will help us meet our goals. For us, it is very important that the portable room air cleaners equipped with High Efficiency Particulate Air (HEPA) filters could reduce indoor levels of airborne particles that can result in allergic reactions or asthma attacks. As per the NCPH web-site, HEPA filters are rated by the manufacturer to capture particulates of 0.3 microns in size with 99.97 percent efficiency. We will also need an UV lamp. Decide how much you are ready to spend now or buy a cheaper product, which will entail further frequent spare parts replacement. Given the fact that in our situation, a no-filter cleaner is not suitable, you’ll have to buy and change the filters. The intensity of use is important to consider. Do you want to keep the cleaner on 24/7 or are you going to turn it on once a week? If you are going to seriously load it, choose an item with a warranty and that is made of quality materials. You won’t even notice the noise during the day. Night is another story though... Some people sleep sound and won’t be bothered by a tractor operating outside, while others wake up with the slightest rustle. If you belong to the second type, pay attention to the level of noise generated. NB! Air cleaners working like a water bath won’t suit you if you try to exterminate dust mites, since they increase air humidity, and dust mites happen to breed in highly humid spots. These are the main criteria to consider when choosing an air cleaner for allergy patients. And I have picked 5 Air Purifiers that suit allergic people; they are market leaders and give 100%-performance. As usual, I begin my review with a best model. Today, it is a #1 Best Seller in HEPA Filter Air Purifiers. It is the air purifier that meets all the requirements listed above. The device has 3 functions: it simultaneously cleans the air of germs and dust by filtering it through a HEPA filter, uses an UV lamp for eliminating microorganisms, sanitizes the room and removes unpleasant odors, filling the room with freshness. GermGuardian will not take up much space in your room; it is a little larger than regular trash bins. It covers an area of 1200 sq. ft., which is more than enough for an apartment, and quite enough for a small private house. In reality, it is able to prove itself, the highest rating of 4.4 out of 5 stars. One of customers had a severe allergy and asthma, and he says that has used this device for a month. As a result, his health improved remarkably, his sleep became sound, and he stopped suffering from nasal congestion. This is a story mentioned in just one review out of nearly 4000! Read all customer reviews on to make sure it really works. «I started using it since I was staying at a home with 2 larger dogs that I was obviously allergic to. It allowed me to live quite comfortable there in an area where the pets weren't allowed. I currently utilize the filter to fight my pet cat allergic reactions, which are dramatically worse than my pet dog allergic reactions. I obtained a hypoallergenic breed due to the fact that I have actually never had the ability to deal with typical felines in all. I would certainly say it has actually been the best aid maintaining me comfy in my living space with my brand-new kittycat. I also live midtown, and also when I relocated, I really intended to maintain my windows open because my apartment feels type of stale and also the outside air is just so great. The problem was that opening up the home window brought about crazy amounts of dust coming in from downtown. I still have to dust the area around my windowsill like as soon as a week, but I trust that my filter truly records a great deal of the air-borne dirt. Because I would actually have bronchial asthma assaults after exercising and also sitting in this home (and I rarely have asthma attacks-- do not even have an inhaler) before I thought to run this filter a lot of the moment». It is not necessary to constantly use GermGuardian: in the beginning you can run it 24/7, and you have established the necessary microclimate, you can turn it on twice: once during the day and once before going to bed as a preventive measure. During the day you can also turn on the UV lamp. Care and maintenance of the device is very simple: all you have to do is not forget to change the HEPA filter inside the purifier once a year to maintain its performance level. Honeywell Purifier’s operation is very similar to that of the previous one. The purifier is equipped with the same HEPA as the ones in the preceding model. Its size is also roughly the same, but the design is less futuristic. For some it may even seem boring, but is really something of high importance? The area of the purifier’s coverage is much less. It is only 390 sq. ft. now. The purifier has one significant advantage: the device is designed in such a way that its coverage angle is 360 degrees. Speaking of downsides, we’ll have to mention lack of UV-lamps. Also, some users complain of the noise from the unit, but in general this is a good cleaner for smaller rooms. This option will be effective for large rooms with an area of up to 160 square feet. However, this guide features products with much better coverage. The HEPA-grade filter can be cleaned with a vacuum and is economical as you do not have to buy a new one to replace it. One of the benefits of this model is its portability as it is just 16 inches long. Apart from that, you can put the unit either horizontally or vertically. The air purifier works quietly and has 3 speed settings. Use a convenient knob to control the device. Apart from covering an area of over 500 square feet, this model boasts having a washable pre-filter designed to capture larger particles. 3-part filtration system captures not only allergens and smoke but also dust mites and pet hair. Consuming only 60 watts, the model can rightly be called an energy efficient device. On top of that, the unit is said to work quietly. Indeed, it produces sounds at 31-56 dB, which is equivalent to an operating refrigerator or computer. This is a compact option at a moderate. If you are allergic to something and are always on the move (you go on business trips or you travel), then this is just the device for you, as it is very convenient to transport and use: all you have to do is plug it in an outlet. GermGuardian GG1000 is not equipped with HEPA filters, but this drawback is offset by a large UV lamp. Since heavy ultraviolet light is harmful, it is contraindicated to remain in a room where such sanitizer is working for a long period of time. You should only turn it on when you’re out. This is a great option for those who suffer from allergies and often leave their home for a long time. Why should allergic people handle ionic air purifiers with care? An Exposé of Air Ionizers’ Benefits and Harm! We’ll tell you about Ionic Air Purifiers separately. Air ionizing itself is extremely useful as it kills microorganisms effectively and cleans the air. But there is a “but”. A certain amount of ozone is given off. Yes, ozone is a powerful air cleaning element, it is used for sterilizing medical instruments and for decontaminating rooms. Nevertheless, you should be careful! The scientists warn that ionic appliances produce ozone, a respiratory irritant. That is why those with allergies are supposed to be out of the room where an ionizer is on. If you turn an ionizer on, make sure you leave the room! 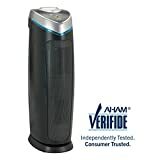 This is a #1 Best Seller in Home Air Ionizers on and I recommend combining it with a purifier. Let us once again remind you that People with respiratory problems or lung disease should consult a physician before using this product. That is why we recommend using it a supplement to an air purifier in order to decontaminate air. Don’t turn it on for over an hour a day. O-Ion B-1000 is equipped with an UV-lamp and will work perfectly together with the Air Cleaner. It will save your money through low energy consumption and with the help of its “eternal” coal filter which needs to be washed about once a fortnight instead of being replaced. This ionizer is popular among those who live with smokers and hate the smell of smoke at home. They say, the air truly becomes cleaner! We have examined multiple Car Air Purifier models, but some new trends turned out to happen and most of them are equipped with an ionizer. While you can leave when an ionizer is working in a room or at your house, a car air purifier is designed especially for purifying the air while you’re inside the car. However, in case you have a severe allergy and spend much time in your car, it’s worth trying to turn it on it periodically and leave the car meanwhile. Here is the most popular compact device, one of the best sellers in the Home Travel-Size Air Purifiers category. Just like the previous models, this ionizer creates negative ions which seek out positively charged particles, such as dust, dander, bacteria, pollen, mold, smoke, chemical vapors, and other allergens and then, once the positive and negative ions are bonded together, they become too heavy to float, and no longer affect the air quality of the surroundings. This might as well be the rare case when we, allergy patients, hope that the manufacturers won’t keep their word and that such a car ionizer won’t turn out to be as powerful and will exude much less ozone than promised (38000000 anions (3.8M negative ions per cm3 / ozone 3Mg/H). In this case, small ozone dosage (or complete absence of thereof) will be safe for us. The customers claim that using this device in a car has become their habit. They turn it on once they’ve reached a grocery store and did their shopping, and once they are back, they turn it off. According to the feedback, this small gadget is best at eliminating the smells of cigarettes and petrol, which are the most irritating smells during a ride.